Acknowledging the Catholic Church’s heavy loss of members in Brazil over recent decades, Pope Francis told the country’s bishops that they must learn to understand and sympathize with the reasons for people’s disaffection and speak to them in a simpler language of beauty, mystery and love. “We need a church capable of walking at people’s side, of doing more than simply listening to them, a church which accompanies them on their journey,” he said. 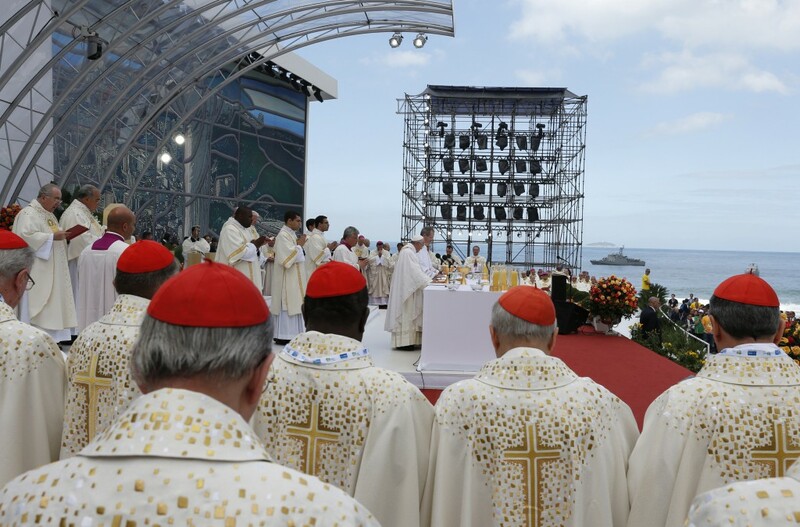 The pope made his remarks July 27 at a meeting with 300 active and retired Brazilian cardinals and bishops. According to the Vatican spokesman, Jesuit Father Federico Lombardi, the five-page speech was the longest to date of his young pontificate. While counseling hope, the pope painted a grim picture of the church’s state in Brazil. Although Brazil has more Catholics than any other country, the church’s share of the country’s population declined from 92 percent in 1970 to 65 percent in 2010, according to a recent study by the Pew Research Center based on Brazilian census data. Pope Francis pointed to the social and cultural impact of what he called a “relentless process of globalization (and) an often uncontrolled process of urbanization” to help explain the change. Pope Francis laid much blame on Catholic leaders, who, he said, had lost power to communicate. The pope also warned the bishops against assimilating fashionable values of secular culture. He gave special attention to the needs of the Amazon basin, in terms of both ecological protection and the training of indigenous clergy to serve indigenous peoples there. “‘Pastoral care’ is nothing other than the exercise of the church’s motherhood,” the pope said. “She gives birth, suckles, gives growth, corrects, nourishes and leads by the hand.